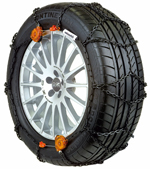 A new range of quality snow chains that is ideal for people who require chains for occasional use such as a ski holiday. 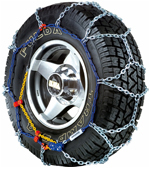 Everest Power X snow chains are produced from quality steel components and using the very simple inner cable mounting system the Everest Power X offers excellent value for money. 17 mm maximum chain projection. The areas highlighted in yellow must exceed 17 mm. The recommended minimum clearance is 19 mm. 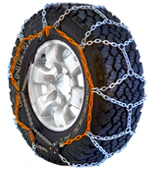 Weissenfels Rex TR is the perfect answer for easy and quick snow chain fitting on 4wd vehicles. Thanks to Weissenfels colour coded flexible hoop mounting system and its autolocking chain tensioning, the Rex TR can be fitted in almost no time at all. In most cases they can be easily fitted without moving or raising the wheels! In fact they can still be put on even if the vehicle is stuck! Every size is available to fit all 4 x 4's such as BMW X5's, Mercedes ML's, Range Rovers, Chrysler Jeeps, Land Rovers and Discoveries etc., as well as mini-buses and light and medium size commercial vehicles. Weissenfels Clack and Go SUV has been created especially for the latest generation of small and medium size SUV's fitted with alloy wheels. The new Clack and Go SUV pre-tensioning system won't mark the wheel at points of contact and because of its construction no part of the chain touches the wheel. Thanks to its special stylish black finish, the Clack and Go SUV goes virtually unnoticed on the tyres. The unique Clack and Go automatic double tensioning system and self centring means you don't have to stop and re tension the chains after fitting. 13 mm maximum chain projection. The areas highlighted in yellow must exceed 13 mm. The recommended minimum clearance is 15 mm. Weissenfels Clack and Go Quattro tensions itself as the vehicle is moving. It is ideal for mid range 4x4s and SUVs. 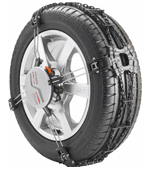 All fitting is is done from the outside of the tyre with absolutely no need to reach behind the wheel.